Before we get to the good part, there is one small cosmetic change to point out. If you're reading through a book, tap on the center of the page to bring up the controls and hit the Contents button at the top. This will take you to a screen with a table of contents, plus tabs for your bookmarks and chapters. There's also a highlighted line for your current page. In old versions, this was always a separate line from the chapters, but the latest update removes the dedicated line and instead uses the current chapter title. 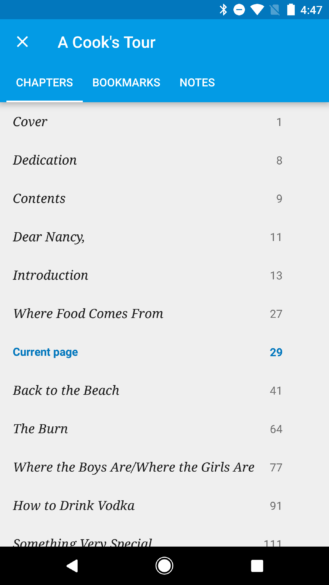 It's still highlighted like the old style, but now the lower line for the page number specifies that it's the current page and the page number for the chapter has been replaced with your current place in the book. Thanks to a teardown of the Play Store, we've known for a few months that Google had audiobooks on the horizon. With a close look at Play Books, version 4.0 has a huge amount of new text relating to audiobooks, playback, casting, and more. There's a lot here, so I'll try to hit each point quickly. Audiobooks and ebooks are going to be split into separate tabs, which makes perfect sense given that they're consumed in completely different ways. Just like regular ebooks, it looks like the Play Store will make sample chapters available for audiobooks. Once you reach the end of a sample, the app will let you know that the next chapter must be purchased to continue listening. Google is highlighting the point that Play Books will use real chapter titles for the audiobooks instead of a series of meaningless track numbers. Naturally, all of the standard playback controls are available. You'll have the standard Play/Pause button, fast forward, and rewind. There is a scrubber bar, so you'll be able to quickly move to a specific time. There's no mention of a skip button for jumping between chapters, but I assume you'll be able to do that from a table of contents. Playback time is shown in a few formats depending on the context and how much space is available. For many listeners, playback speed is a critical feature for audiobooks (and podcasts, /cough), and that hasn't been ignored here. 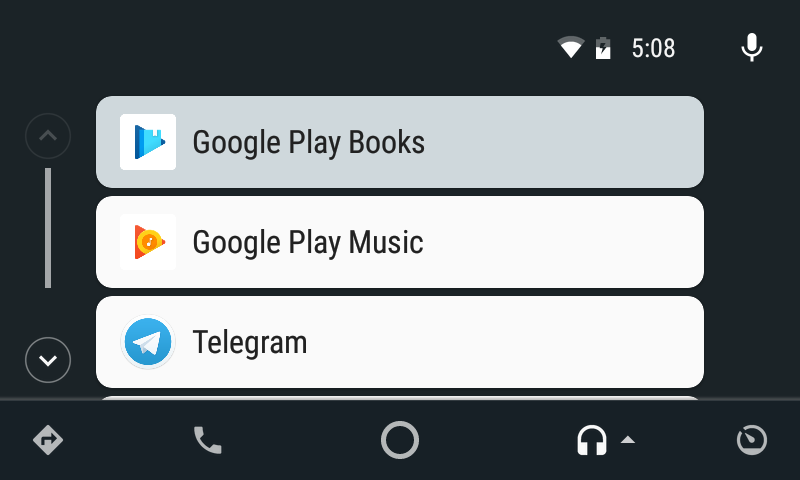 Play Books will default to 1x, but you'll be able to adjust it up or down to fit your preference. I'm not sure what the caps are set to. 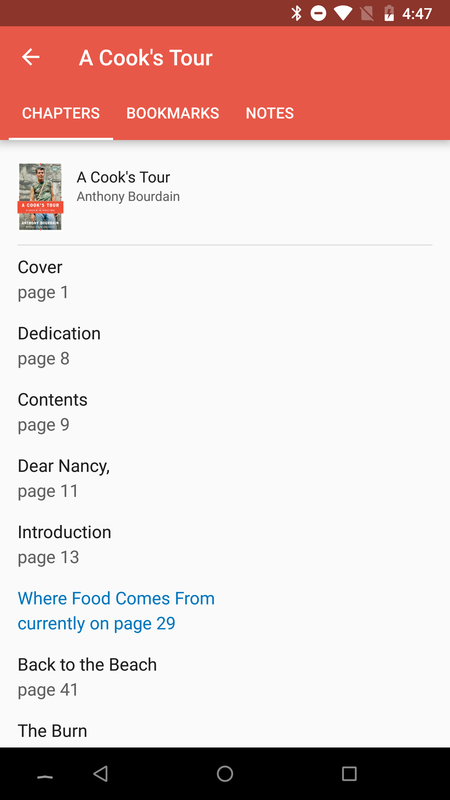 Another important feature for audiobooks is keeping your current position, or more to the point, syncing it with a server. Play Books will keep your position so you won't lose your place if something happens to your phone. Not only that, but if you're using more than one device to play an audiobook, you'll be told if the device you're currently listening to is ahead of or behind another device and get the option to jump to the place where that device left off. This is particularly useful if you use your current phone for listening during a commute, but then switch to listening on a tablet or an old phone when you get home. 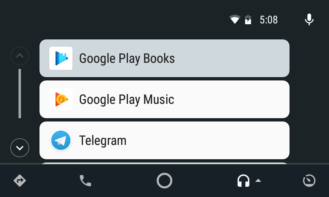 It should come as no surprise that Play Books will also support Google's casting feature, so you'll be able to send audio to a speaker, television, or headphones for listening around the house. Note, most of the lines related to casting are included by a standard library, so there may be some text here that won't actually be used in the app. If you're using audiobooks to help you get to sleep at night, you probably don't want to continue playing a book for hours after you're out cold. A standard sleep timer will be available so you can drift off safe in the knowledge that your phone won't be burning battery for the next 7-9 hours. The timer can be set to turn off after 15 minutes, 30 minutes, 60 minutes, or when the current chapter is finished. One catch appears to be that the sleep timer doesn't work if you're casting, so that's something to consider. Probably the single best environment for an audiobook is when you're stuck in a car for the next 5 hours on the drive through the middle of nowhere. Fortunately, this situation will be covered, as well. 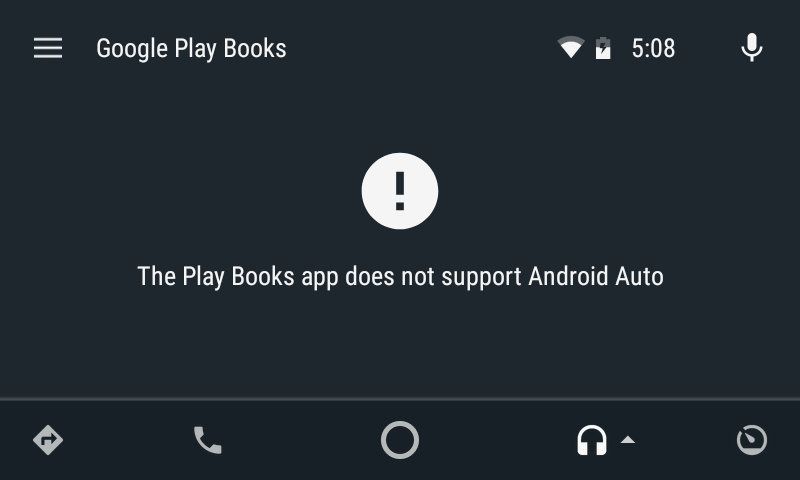 Play Books has Android Auto support with this version. In fact, you can update to v4 right now and plug it into a car with Auto to see Play Books in the list of audio sources. 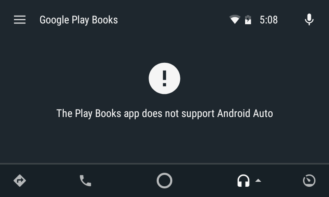 Unfortunately, if you actually select Play Books, you're going to get a warning message that it isn't supported on Android Auto. That's obviously going to change after audiobooks launch. Considering the sheer amount of additions and the Android Auto support is technically already visible, it's pretty safe to say that audiobooks are going to launch eminently. I'd be surprised if the announcement wasn't made in the first half of next week. Play Books already has notification channels, but the title for a Miscellaneous channel was added in this update. This channel isn't live yet, at least not for me, but I assume it probably will be fairly soon. I'm sure most people don't care about this, but if there are people meticulously managing each notification, this information might be useful to them.